NASA's Voyager 1 spacecraft has entered the outer edge of our solar system and interstellar space. NASA is calling the craft's new home the "stagnation region" — a kind of "cosmic purgatory" whereby the wind of charged particles emitted from the sun has calmed, the solar system's magnetic field is compacted, and particles of higher energy appear to be leaking out of the solar system and into interstellar space. "During this past year, Voyager's magnetometer also detected a doubling in the intensity of the magnetic field in the stagnation region. Like cars piling up at a clogged freeway off-ramp, the increased intensity of the magnetic field shows that inward pressure from interstellar space is compacting it." The 1,592-pound Voyager 1 craft launched in 1977 is in good health, travelling at just under 11 miles per second and feeding back data from its position some 11 billion miles (aka, 119 astronomical units) away from the sun. That makes it the farthest man-made object from Earth and likely the first probe to leave the comfort of our own solar system sometime in the next five years. Like its Voyager 2 sister, Voyager 1 carriers a gold-plated disc with photos of Earth and its inhabitants along with spoken greetings from the species called "Homo sapien." 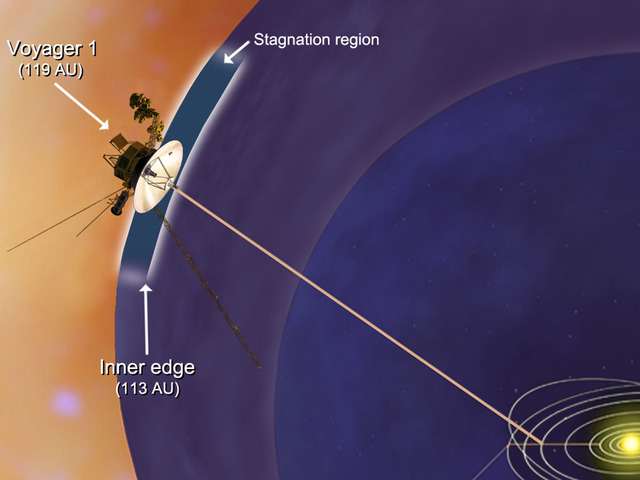 Voyager 1's trio of radioisotope thermoelectric generators are expected to power the probe until at least the year 2025. Watch the video below for a quick summary of its accomplishments. Please check out the video in this page , amazin stuff. Can someone please explain some stuff here? what is interstellar? and in the end of the video theres a graphic explanation of some wind , anyone understand that? Last edited by SysTaMatIcS; 12-06-2011 at 04:59 PM.